Simple Charging- Similar to AR15 Style Handle This makes it Ambidextrous. Foam cover on stabilizer tube for comfort. Weighs less than any other conversion on the market. Includes VTS tactical support (handstop). The Pathfinder KPOS was introduced to provide shooters with the benefits of the KPOS system without the restrictions of SBR laws. The ATFE has ruled that a stabilizer tube attached to a pistol does not change the classification of the pistol. The KPOS Pathfinder is a KPOS G2 with a folding stabilizer tube instead of a stock. This allows the Pathfinder KPOS to be installed on a pistol without changing the classification of the pistol, yet provides a stable cheekweld for accuracy. The Pathfinder KPOS is stabilized by the shooters hands on the pistol, the shooter's cheek on the stabilizer tube, and the sling on the shooter's body. Pushing the Pathfinder KPOS forward against the sling creates tension and stabilizes the pistol. The Pathfinder KPOS system creates a pistol that can easily mount optics and accessories and has stability similar to a carbine for safer, more accurate shooting and longer range accuracy. 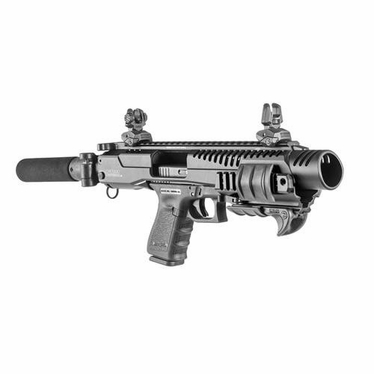 The kit includes the Pathfinder KPOS, folding sights, a VTS handstop, and a tactical sling. Disclaimer: The installation of a forward vertical grip or a buttstock on the Pathfinder KPOS will change the classification of the pistol and require registration as an AOW or SBR. Compatible with steel framed Jericho 941 without Picatinny rail.